Unnecessary drama isn’t usually my thing, but at 12:54pm on Thursday — already 48 hours after failing to meet my copy deadline for this very column — I shot that exact same message over to the page editor. My story plan had fallen through. With no last-minute ideas springing to mind, I envisioned a blank page going to press on Saturday, with an involuntary P45 following shortly after on Sunday (the piece of paper handed to Brits in the UK upon termination of employment). Minutes later a ‘face screaming in fear’ emoji appeared on my phone’s home screen. It was an apt reply from the page editor. Almost as dramatic as my initial SOS message. The headline read: ‘Write letter, get chance to win Dh4.7 million house’. Urgh, I thought. A clickbait headline with the usual lackluster content. Definitely not a contender. But as I read through the piece, it was legit. After five months on the market and not a buyer in sight, a Canadian homeowner in ill health has pledged to give away her pad in exchange for some scribbles on a piece of paper. Or through e-mail (of course). For a competition entry fee of about Dh69 and a well-penned letter, the three-bed mansion in the Rockies is up for grabs to the writer who impresses Alla Wagner the most. Something “compelling” is what she’s after. And just 350 words too; a more-than-manageable task for what could land you your dream home. The aim is to get at least 60,000 letter entries, enough to cover her home’s current C$1.7 miillion listing price, the amount she failed to secure through traditional real estate methods. I definitely had a little chuckle at the concept. 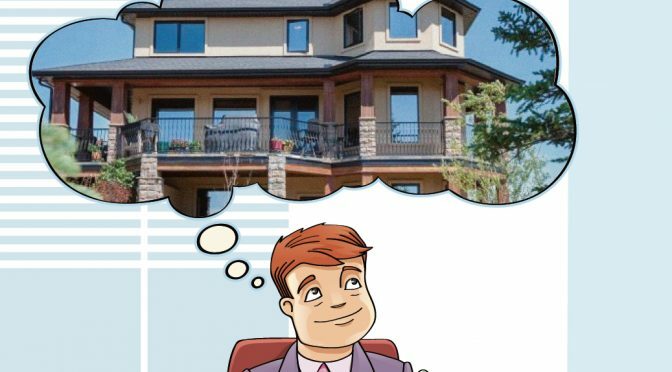 The idea has a unique appeal: ‘author yourself a multimillion dollar dream home’. It certainly beats the run-of-the-mill ‘list home, barter on price and sell’ approach to moving house. It’s a bit cheeky too, one of those ‘I wish I had thought of that’ moments. Of course, being a writer, my initial response was to give it a shot. And ironically, I’ve just given up the lease on my studio, so something a little more roomy in the Rockies wouldn’t go a miss. I’d happily swap my current construction site views for snow-capped mountains on my doorstep. And if my Dh69 gamble pays off, winner! The story has been picked up by the Press around the globe and, as expected, has been getting mixed reactions. Some, like me, are applauding Wagner’s audacity, and, like me, they’re taking a leap of faith in the hopes of one day owning the mini mansion for next to nothing. While others — those in the real estate business, perhaps — have approached the news with sobering practicality, sucking all the fun out of it. “C$1.7 million is way over market value. The property taxes are in excess of C$6,000 too, so whomever ‘wins’ the contest will have to be cognizant of this fact,” one person wrote. “After you win you’ll have taxes to pay on a 1.7 million dollar home plus utilities and upkeep. No thanks,” another posted. Regardless of life’s realities, the reactions are laughable. Why not just take the story for what it is: a bit of fun and a unique opportunity. Write a letter, see where it gets you. If you end up striking lucky (or unlucky as the pessimists would have you believe) and you are bundled with C$6,000 in housing tax, put the house back on the market for, say, C$500,000. You’ll still come out on top. Describing her home as “a writer’s or artist’s paradise”, you get the impression Wagner knows her stuff; maybe even a writer herself. Luring those to try their luck, she’s specified the piece has to be thought provoking and worthy of her family home. Those interested will be required to answer why moving to this lakefront dream home will change their life. But rather disappointingly, it’s the public who will vote on the entries and determine the winner. That kind of took the romanticism out of it for me, at first. There I was, imagining an ailing, ill-of-health Wagner sniffling over letter after letter, determined to pick the right person for her treasured homestead. Instead, it’s us, the fickle public who will decide. Shame. Despite that, I’ll still give it a shot. But now I’m grappling with how best to start my letter. A simple ‘Dear …’ won’t suffice. That’s neither inventive or compelling. You’d think as a writer myself, conjuring up a 350-word letter would be a breeze, but actually, much like penning this last minute column, it’s a tough task. I don’t have a sob story. I don’t do impassioned pleas and quite frankly; there’s a million others before me more deserving of this home. Attempting to stand out on top of 59,999 other entries will require something either achingly heart-wrenching (a story I just don’t have), or off the wall, like this very competition. So I think that’s what I’ll settle on. Wish me luck, and hopefully by the summer I’ll be writing a column on ‘how I penned my way to my dream home’.